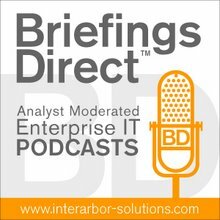 Gardner: Why are business cloud services such an important initiative for you? Costello: AT&T has been in the hosting business for over 15 years, and so it was only a natural extension for us to get into the cloud services business to evolve with customers' changing business demands and technology needs. We have cloud services in several areas. The first is our AT&T Synaptic Compute as a Service. This is a hybrid cloud that allows VMware clients to extend their private clouds into AT&T's network-based cloud using a virtual private network (VPN). And it melds the security and performance of VPN with the economics and flexibility of a public cloud. So the service is optimized for VMware's more than 350,000 clients. If you look at customers who have internal clouds today or private data centers, they like the control, the security, and the leverage that they have, but they really want the best of both worlds. There are certain workloads where they want to burst into a service provider’s cloud. We give them that flexibility, agility, and control, where they can simply point and click, using free downloadable tools from VMware, to instantly turn up workloads into AT&T's cloud. Another capability that we have in this space is AT&T Platform as a Service. This is targeted primarily to independent software vendors (ISVs), IT leaders, and line-of-business managers. It allows customers to choose from 50 pre-built applications, instantly mobilize those applications, and run them in AT&T's cloud, all without having to write a single line of code. So we're really starting to get into more of the informal buyers, those line-of-business managers, and IT managers who don't have the budget to build it all themselves, or don't have the budget to buy expensive software licenses for certain application environments. Examples of some of the applications that we support with our platform as a service (PaaS) are things like salesforce automation, quote and proposal tools, and budget management tools. The third key category of AT&T's Cloud Services is in the storage space. We have our AT&T Synaptic Storage as a Service, and this gives customers control over storage, distribution, and retrieval of their data, on the go, using any web-enabled device. In a little bit, I can get into some detail on use cases of how customers are using our cloud services. This is a very important initiative for AT&T. We're seeing customer demand of all shapes and sizes. We have a sizable business and effort supporting our small- to medium-sized business (SMB) customers, and we have capabilities that we have tailor-developed just to reach those markets. As an example, in SMB, it's all about the bundle. It's all about simplicity. It's all about on demand. And it's all about pay per use and having a service provider they can trust. It's all about simplicity. It's all about on demand. In the enterprise space, you really start getting into detailed discussions around security. You also start getting into discussions with many customers who already have private networking solutions from AT&T that they trust. When you start talking with clients around the fact that they can run a workload, turn up a server in the cloud, behind their firewall, it really resonates with CIOs that we're speaking with in the enterprise space. Also in enterprises, it's about having a globally consistent experience. So as these customers are reaching new markets, it's all about not having to stand up an additional data center, compute instance, or what have you, and having a very consistent experience, no matter where they do business, anywhere in the world. Gardner: The fact is that a significant majority of CIOs and IT executives are men, and that’s been the case for quite some time. But I'm curious, does cloud computing and the accompanying shift towards IT becoming more of a services brokering role change that? Do you think that with the consensus building among businesses and partner groups being more important in that brokering role, this might bring in a new era for women in tech? Costello: I think it is a new era for women in tech. Specifically to my experience in working at AT&T in technology, this company has really provided me with an opportunity to grow both personally and professionally. I currently lead our Cloud Office at AT&T and, prior to that, ran AT&T’s global managed hosting business across our 38 data centers. I was also lucky enough to be chosen as one of the top women in wireline services. The key to success of being a woman working in technology is being able to build offers that solve customers' business problem. What drives me as a woman in technology is that I enjoy the challenge of creating offers that meet customer needs, whether they be in the cloud space, things like driving eCommerce, high performance computing environment, or disaster recovery (DR) solutions. I love spending time with customers. That’s my favorite thing to do. I also like to interact with many partners and vendors that I work with to stay current on trends and technologies. The key to success of being a woman working in technology is being able to build offers that solve customers' business problem, number one. Number two is being able to then articulate the value of a lot of the complexity around some of these solutions, and package the value in a way that’s very simple for customers to understand. Some of the challenge and also opportunity of the future is that, as technology continues to evolve, it’s about reducing complexity for customers and making the service experience seamless. The trend is to deliver more and more finished services, versus complex infrastructure solutions. I've had the opportunity to interact with many women in leadership, whether they be my peer group, managers that work as a part of my team, and/or mentors that I have within AT&T that are senior leaders within the business. I also mentor three women at AT&T, whether they be in technology, sales, or an operations role. So I'm starting to see this trend continue to grow. It enables us to deliver a mobile cloud as well. That helps customers to transform their businesses. Gardner: You have a lot of customers who are already using your business network services. I imagine there are probably some good cost-efficiencies in moving them to cloud services as well. Costello: Absolutely. We've embedded cloud capabilities into the AT&T managed network. It enables us to deliver a mobile cloud as well. That helps customers to transform their businesses. We're delivering cloud services in the same manner as voice and data services, intelligently routed across our highly secure, reliable network. AT&T's cloud is not sitting on top of or attached to our network, but it's fully integrated to provide customers a seamless, highly secure, low-latency, and high-performing experience. Gardner: Why did you chose VMware and vCloud Datacenter Services as a core to the AT&T Synaptic Compute as a Service? Costello: AT&T uses VMware in several of our hosting application and cloud solutions today. In the case of AT&T Synaptic Compute as a Service, we use that in several ways, both to serve customers in public cloud and hybrid, as well as private cloud solutions. We've also been using VMware technology for a number of years in AT&T’s Synaptic Hosting offer, which is our enterprise-grade utility computing service. We've also been serving customers with server virtualization solutions available in AT&T data centers around the world and also can be extended into customer or third-party locations. Just to drill down on some of the key differentiators of AT&T Synaptic Compute as a Service, it’s two-fold. One is that we integrate with AT&T private networking solutions. Some of the benefits that customers enjoy as a result of that are orchestration of resources, where we'll take the amount of compute storage and networking resources and provide the exact amount of resources at the exact right time to customers on-demand. Our solutions offer enterprise-grade security. The fact that we've integrated our AT&T Synaptic Compute as a Service with private networking solution allows customers to extend their cloud into our network using VPN. An engineering firm can now perform complex mathematical computations and extend from their private cloud into AT&T’s hybrid solution instantaneously, using their native VMware toolset. Let me touch upon VMware vCloud Datacenter Services for a minute. We think that’s another key differentiator for us, in that we can allow clients to seamlessly move workloads to our cloud using native VMware toolsets. Essentially, we're taking technical complexity and interoperability challenges off the table. With the vCloud Datacenter program that we are part of with VMware, we're letting customers have access to copy and paste workloads and to see all of their virtual machines, whether it be in their own private cloud environment or in a hybrid solution provided by AT&T. Providing that seamless access to view all of their virtual machines and manage those through single interface is key in reducing technical complexity and speeding time to market. We've been doing business with VMware for a number of years. We also have a utility-computing platform called AT&T Synaptic Hosting. We learned early on, in working with customers’ managed utility computing environments, that VMware was the virtualization tool of choice for many of our enterprise customers. As technologies evolved over time and cloud technologies have become more prevalent, it was absolutely paramount for us to pick a virtualization partner that was going to provide the global scale that we needed to serve our enterprise customers, and to be able to handle the large amount of volume that we receive, given the fact that we have been in the hosting business for over 15 years. As a natural extension of our Synaptic Hosting relationship with VMware for many years, it only made sense that we joined the VMware vCloud Datacenter program. VMware is baked into our Synaptic Compute as a Service capability. And it really lets customers have a simplified hybrid cloud experience. In five simple steps, customers can move workloads from their private environment into AT&T's cloud environment. Think that you are the IT manager and you are coming into start your workday. All of a sudden, you hit 85 percent utilization in your environment, but you want to very easily access additional resources from AT&T. You can use the same console that you use to perform your daily job for the data center that you run in-house. In five clicks, you're viewing your in-house private-cloud resources that are VMware based and your AT&T virtual machines (VMs) running in AT&T's cloud, our Synaptic Compute as a Service capability. That all happens in minutes' time. Gardner: I should also think that the concepts around the software-defined datacenter and software-defined networking play a part in this. Is that something you are focused on? If we start with enterprise, the security aspects of the solution had to prove out for the customers that we do business with. Costello: Software-defined datacenter and software-defined networks are essentially what we're talking about here with some uniqueness that AT&T Labs has built within our networking solutions. We essentially take our edge, our edge routers, and the benefits that are associated with AT&T networking solutions around redundancy, quality of service, etc., and extend that into cloud solutions, so customers can extend their cloud into our network using VPN solutions. Previously many customers would have to buy a router and try to pull together a solution on their own. It can be costly and time consuming. There's a whole lot of efficiency that comes with having a service provider being able to manage your compute storage and networking capabilities end to end. Global scale was also very critical to the customers who we've been talking to. The fact that AT&T has localized and distributed resources through a combination of our 38 data centers around the world, as well as central offices, makes it very attractive to do business with AT&T as a service provider. Gardner: We've certainly seen a lot of interest in hybrid cloud. Is that one of the more popular use cases? Costello: I speak with a lot of customers who are looking to be able to virtually expand. They have data-center, systems, and application investments and they have global headquarters locations, but they don't want to have to stand up another data center and/or virtually expand and/or ship staff out to other location. So certainly one use case that's very popular with customers is, "I can expand my virtual data-center environment and use AT&T as a service provider to help me to do that." Another use case that's very popular with our customers is disaster recovery. We see a lot of customers looking for a more efficient way to be able to have business continuity, have the ability to fail over in the event of a disaster, and also get in and test their plans more frequently than they're doing today. For many of the solutions that are in place today, clients are saying they are expensive and/or they're just not meeting their service-level agreements (SLAs) to their business unit. One of the solutions that we recently put in place for a client is that we put them in two of AT&T's geographically diverse data centers. We wrapped it with AT&T's private-networking capability and then we solutioned our AT&T Synaptic Compute as a Service and Storage as a Service. The customer ended up with a better SLA and a very powerful return on investment (ROI) as well, because they're only paying for the cloud resources when the meter is running. They now have a stable environment so that they can get in and test their plans as often as they'd like to and they're only paying for a very small storage fee in the event that they actually need to invoke in the event of a disaster. So DR plans are very popular. Another use case that’s very popular among our clients is short-term compute. We work with a lot of customers who have massive mathematical calculations and they do a lot of number crunching. Finally, in the compute space, we're seeing a lot of customers start to hang virtual desktop solutions off of their compute environment. In the past, when I would ask clients about virtual desktop infrastructure (VDI), they'd say, "We're looking at it, but we're not sure. It hasn’t made the budget list." All of a sudden, it’s becoming one of the most highly requested use cases from customers, and AT&T has solutions to cover all those needs. The fact that we have 38 data centers around the world, a global reach from a networking perspective, and all the foundational cloud capabilities makes a whole lot of sense. Gardner: Do you think that this will extend to some of the big data and analytics crunching that we've heard about? Costello: I don’t think anyone is in a better position than AT&T to be able to help customers to manage their massive amounts of data, given the fact that a lot of this data has to reside on very strong networking solutions. The fact that we have 38 data centers around the world, a global reach from a networking perspective, and all the foundational cloud capabilities makes a whole lot of sense. Speaking about this type of a "bursty" use case, we host some of the largest brand name retailers in the world. When you think about it, a lot of these retailers are preparing for the holidays, and their servers are going underutilized much of year. So how attractive is it to be able to look at AT&T, as a service provider, to provide them robust SLAs and a platform that they only have to pay for when they need to utilize it, versus sitting and going very underutilized much of the year? We also host many online gaming customers. When you think about the gamers that are out there, there is a big land rush when the buzz occurs right before the launch of a new game. We work very proactively with those gaming customers to help them size their networking needs well in advance of a launch. Also we'll monitor it in real time to ensure that those gamers have a very positive experience when that launch does occur.